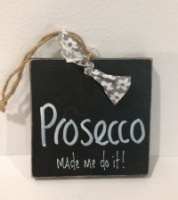 Wooden 'Prosecco made me do it!' hanging sign, hand made for Hilly Horton Home. 10cm x 10cm, with rustic string hanger & contrasting bow. Makes a perfect gift for any occassion.